← Genesis 3:1-7 No Independence for You! 20 The man called his wife’s name Eve, because she was the mother of all living. [g] 21 And the Lord God made for Adam and for his wife garments of skins and clothed them. 22 Then the Lord God said, “Behold, the man has become like one of us in knowing good and evil. Now, lest he reach out his hand and take also of the tree of life and eat, and live for ever—” 23 therefore the Lord God sent him out from the garden of Eden to work the ground from which he was taken. 24 He drove out the man, and at the east of the garden of Eden he placed the cherubim and a flaming sword that turned every way to guard the way to the tree of life. It often starts with dating. In my twenties I would blame my girlfriend for how I felt. I was never quite happy. Alone I felt awful, but with a girlfriend the sense of inadequacy subsided. I got into a pattern of casting myself as the hero – the victim in many cases. Life just happened to me and I was cast a bad lot. I often felt unloved or misunderstood and I blamed my girlfriends for being immature or lacking intelligence. In talking to twentysomethings I find that this story is often repeated. I am aghast sometimes at how I am told by people the flaws that drive them crazy in their girlfriends because I see the same flaws in the one who is telling me. There are many reasons for this. A cousin of denial is projection. To deal with our own stuff we often project our flaws on someone who is close to us. In doing that we can tell the flaw in ourselves what we really think of it because we don’t own it any more. A second reason for blame is the consequences that we hide from. What do we believe the consequences of failure or inadequacy are? Our families may have trained us very well in thinking that flaws are reasons for rejection and so we reject others whose flaws we see while hiding from the flaws that we have. Finally, a reason that we blame others is ‘locus of control’. If you believe that you have no control because control is outside of yourself, nothing is really ever your fault. You have no sense of real responsibility. In the passage the blame game runs quickly down the line. Man blames God and woman. Woman blames serpent. Serpent is stuck. However, God dishes out the punishment by going back up the line. Serpent. Woman. Man. Rather than no-one being responsible, everyone is. That is more frequently the case in marriage. When we are focusing on our spouse’s garbage we are hiding from our own. We can’t stand the emotional pain of our own shortcomings so we pass it on. However, if we could tolerate the pain of our own depravity we might be able to address it better. When our emotions, especially fear and anger, start raging, rather than go on the warpath it is better to ask a question: What is this really about? How have I felt this way before? Is this a pattern? We can’t change our spouse. We can only learn to accept them with their flaws. Some spouses are truly abusive and we need to hand them over to God and leave the abuse. In most cases of domestic conflict there is a fight for power and control. One spouse must win the game, so we think. The winner will triumph by proving themselves righteous – by assigning blame. They may win the battle of the moment, but they are losing the war for their marriage. May we not pass blame on down the line. May we accept what is ours. When we feel bad, let us see more clearly what has caused the hurt. If it is a pattern of our own making, let us be mature enough to address that. What was the immediate consequence of sin? How would you describe the change in relationship? Do you blame others? When? How do you stop the blame game from taking hold? 1.What was the immediate consequence of sin? Their eyes were now clear that they were able to see each other naked and be ashamed, embarrassed. So they hid themselves from God. 2.Who blamed whom? Adam blamed Eve. 3.How would you describe the change in relationship? Before the Fall (or sin), Adam and Eve loved each other and had care for each other, whereas now they were blaming each other for wrongdoing. 4.Do you blame others? When? Sometimes. I would blame my sister or God when I would be overwhelmed and stressed with school or other broken relationship I have with other people. 5.How do you stop the blame game from taking hold? I try to lay it down to God and ask God to take over. Then, I have peace in my heart. 2. Adam blamed Eve (and God for giving him Eve); and Eve blamed the serpent. 3. The original safety in vulnerability and shamelessness was lost. 4. Sometimes, when I stop heeding the very advice I give to kids to worry about their own responsibility. 5. Take responsibility for my own actions. 3. How would you describe the change in relationship? The man and woman went from complete trust and joy both in each other and in God and went to being ashamed of each other, blaming each other, and even hiding from their Maker and God. So there was a change in relationship between the man and the woman and between the humans and God. 4. Do you blame others? When? I blame others when I find myself struggling with something. I think that because I am dealing with it, I should be able to find someone who must have caused it. Blame shifting is one of the oldest sins in the Bible as it was found in the garden. It is so easy in a marriage to blame your spouse and assume they are the cause for your grief, but the reality is is that we are to blame because of the sin in our own life that we are refusing to address. I would like to hear your perspective and have you expound more deeply on generational sin and how we recognize that there is generational sin but to not just point the finger at the generation before them. Adam and and Eve were in a relationship that was innocent, pure and whole because they were in complete relationship with God. But then, their relationship became full of shame, hidden things and blame because they were separated from complete wholeness in the Lord. By having the mindset of a “champion”. i will reap what I sow. I must take responsibility for my actions. We tend to blame others because of our own sin and depravity. Oftentimes, it is so much easier to blame someone else for our failures as opposed to taking responsibility for them and working to change. When we blame others for our sin, we don’t actually have to look at our sin and when we don’t have to look at it, we don’t work to change. Do you blame others? When? How do you stop the blame game from taking hold? Yes, I blame others. I am afraid of my own sin because I view that as failure. If I can find a way to put the responsibility on somebody else, I can convince myself for a moment that I am doing fine and that I am not at fault. Yet I have been finding lately that regardless of others’ sin, my response is my own and I am responsible. Yes, they are responsible for the hurt that they caused me. Yes, they are responsible and will answer to God for their sins. But no, that does not justify my sinful response. I have been discovering the depth of my own sin and the depth of God’s love for me in a few of my relationships lately. Understanding that I am this sinful and yet still this loved is changing my heart so that I am not as eager to blameshift. Once I take my eyes off of Christ, though, I immediately start falling back into this pattern. I think it’s funny the things that stick with us. I specifically remember a sermon that my Dad preached on this very chapter and theme. It happened, I think, when I was around 10 years old. In his sermon he called blaming others “passing the buck,” and I can vividly remember passing around a dollar bill that he had handed me and my siblings. We blame others for our own personal failings, and others do this to us as well. This is definitely a vicious cycle, and one that never leads us anywhere. Ugh, the blame game is SO EASY to play. Sometimes it is blaming other people. Sometimes it is blaming circumstances. And sometimes it is blaming God. I’ve struggled a lot with the last one, especially, in recent years. When circumstances seems out of control, when life is hard, when I see suffering, I tend to question and blame God. Stopping the blame game, particularly when blaming others, can mean stepping up and taking responsibility for my own sin and flaws. When it comes to the blame game with God, it can be harder to stop. 5. You own up to your mistakes. You live by 1 Corinthians 13. Love holds no record of wrongs. Perhaps something is not your fault and clearly someone else’s. We are urged in this verse to look over it, swallow our pride, and humble ourselves before God and the person. It is okay and human to make mistakes. It is immature and misdirected to blame someone else. I think the person I blame most for my shortcomings is God himself. Every time I commit a blunder I think where was God to stop me? Why would God let me get myself into this situation? Why did God not intervene in some obvious way? These questions that I find myself asking without even really acknowledging them, are completely ridiculous. I commit sin. I make my own choices in my disobedience, but then ask God why he would make me inherently disobedient- which he did not. By his grace he tolerates this. He puts up with my complaining and false accusations and continues to reveal himself to me, showing me everyday that his grace is sufficient, molding me into his likeness focusing on who he is, relying on the Holy Spirit. 1. Fear and shame were the immediate consequences or maybe a fear of being shameful. 2. Adam blamed Eve and Eve blamed the serpent. 3. As man and woman their love for each other was overtaken by a desire to protect self from blame. They did not love each other enough for their knee jerk reaction to be to take the blame for their own sin or to protect the other. 4. I blame others when I do not want to acknowledge something is my fault even when I really know it is. I blame others because I do not want to deal with stuff. 5. I think we stop it by standing up and taking the blame ourselves, but before we can do that we have to realize the depths of our depravity and realize the reality that we have a Savior. 1. Adam and Eve’s eyes were opened and they felt shame. 3. Adam and Eve were vulnerable before the fall and they were in perfect harmony with each other and with God. 4. I blame others quite often. I don’t own up to my own shortcomings very often. 5. To stop the blame game, I need to realize that while I try my best, sometimes I will fall short. I need to accept the fact that I am fallen and that I will mess up. This helps me find grace for others when they mess up too. The immediate consequence was a feeling of shame and guilt. Adam blamed Eve and she then blamed the Serpent. The relationship changed because now they needed someone to blame for the guilt they felt and this was something new in the relationship. I blame others because I don’t like admitting that I’m in the wrong. I also blame God for allowing me to be in situations that may cause me to sin; this is very foolish of me. I must always remind myself of the grace God pours out and give myself grace when needed as well. When we have sinned against God even though we have not admitted to it. We then seek to put the blame on someone because we know the pain we might experience when we admit to our sin. It’s not easy to admit that you’re wrong. No body wants to be wrong. Yes, I had to admit weakness this past week over the assignment. No-one likes being wrong. 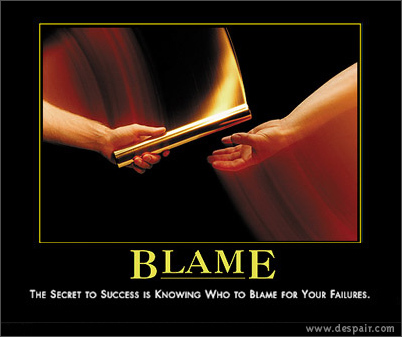 The blame game, something we find so commonly in ALL relationships. It is so much easier to blame someone else for your actions, because then the weight of the decision is transferred on to someone else. Although no matter how much we blame others, it ends up coming back to us in some way or another.